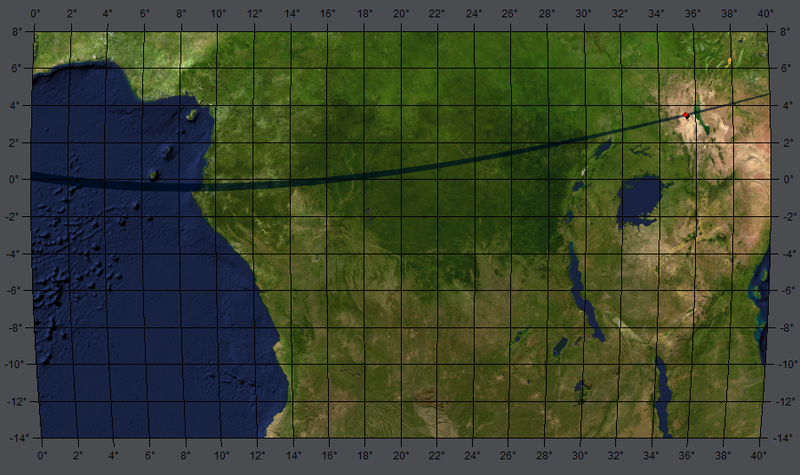 The 8th Shadow-tracking Expedition had four observing places. The first one was in Gabon, the second in Uganda and the third and fourth ones were in Kenya. The expedition to Kenya was led by Shadia Habbal (Institute for Astronomy, University of Hawaii) and organized by Kristián Molnár (Slovakia). 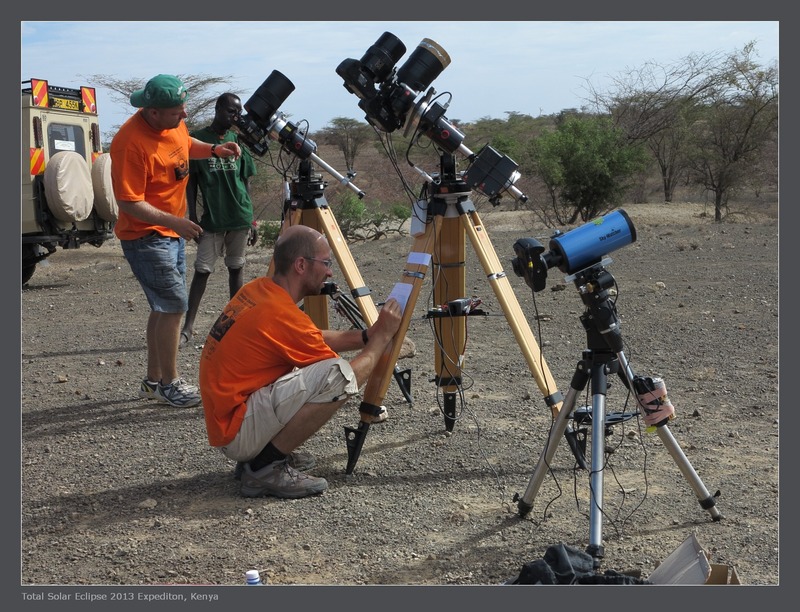 The camp of the expedition and the main observing place was near Turkana Lake where the eclipse was observed by Shadia Habbal, Peter Aniol (Germany, Astelco), Martin Dietzel (Germany), Adalbert Ding (Germany), Judd Johnson (USA). The good weather prospects and very good weather before eclipse finally ended with disappointment. The eclipse near Turkana Lake clouded out totally because of a huge cumulonimbus cloud. Fortunately the members of the expedition in Kenya split up in order to minimize the risk. Pavel Štraha (Czech Republic) and Kristián Molnár (Slovakia) observed the eclipse about 42 km westward from the camp (E 35° 26.779', N 3° 29.701', Alt. 565 m). The observing conditions were far from to be perfect because more than a half of corona was obscured by clouds however the fine coronal structures are surprisingly very well visible in processed images even through rolling clouds. Moreover the images have their own beauty. The totality was extremely short - only 10 s (measured value). That is why one camera was definitely not enough for acquiring data for a good solar corona image. Five different digital cameras and one classical film camera were used for that purpose. Combining data of these cameras enabled to create presented images. The clouds made the image processing very complicated, especially the composing of all images in one high-dynamic range image (3×64 bit/pixel) which was used for final visualization. Note: If any page needs more than 100 KB to be downloaded, there exists its lower quality version appointed for slow connection.